What better way to re-vamp my summer wardrobe than by making it a challenge? So I’m resolved to buy (& show you) one new or thrifted dress every month until the fall comes around. I’m joining as well. I should try to attempt more thrifted dresses. But I have the patience of a five year old and last about 3 minutes in most thrift stores before I bail. I’ll give it the old college try. Anyway, I’ll hopefully be buying a dress in Vegas to show off. As said by David Puddy “What does the Gap in Rome have that you can’t find in the GAP in NYC?” I’ll have you know it’s way more exciting to purchase ANYTHING in Vegas. Even if the Anthropologie has the same inventory, I BOUGHT IT IN VEGAS, DAMMIT. Speaking of Vegas, I’ll be there in roughly 13 hours. Pants? They’ve been peed in. previousHow do I decide?! I know! Ask the internets! nextBecause it wouldn’t be a vacay without drama. Found you through d-listed and am following, we’d love for you to follow us back! Hi there! Dropping by from the D-List. You were above me an over a bit and since I liked your title, especially the sarcasm part, I figured I’d drop by. 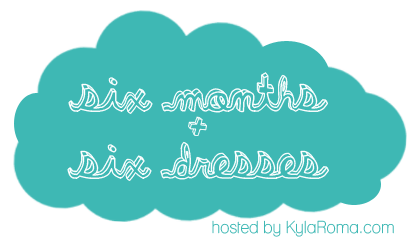 I love the idea of revamping your wardrobe with 6 dresses! I probably have 2 that I wear. I wish I were more girly and knew how to dress girly! I hope you have fun and can spend more than 5 min in a thrift shop!! Actually, the button of mine that’s by yours is my brand new product review site that I’ve just spun off of my other site Woven by Words. So, the button next to yours is Marvelous Mom Reviews. Sorry for the confusion! Do it! I’m playing too!